Every time I visit San Francisco’s Ferry Building I have a blast; there’s always something new to discover and, of course, my old favorites to stock up on. Needless to say, this past Saturday was no different. While I wandered off to Mariposa Bakery for a gluten-free (dairy-free, soy-free) bear claw, David hit up Prather Ranch Meat Company’s American Eatery across the hall. While I enjoyed my pastry (heads up: I found it very sweet, probably better-suited to dividing into a couple servings instead of tackling yourself [myself] all at once), I would have liked it even more had someone not selected an avocado-ham-cheese-runny-yolked-egg-Acme-challah-bun breakfast sandwich for himself — it smelled so, so good. Naturally, this led me to recreating it at home — using homemdade gluten-free brioche buns and bacon in place of challah and a pile of shaved ham — and being ever so thankful that I did. It looks unmanageable, but you can totally eat it sans fork and knife — it helps if you poke the center of the yolk so it oozes all over the top bun and into the pile of toppings below in a somewhat more controlled manner. And just in case, have a plate underneath and pile of napkins at the ready! In terms of strategy for what to make when, I recommend baking the buns at least the night (up to a couple days) before if you want to serve these for breakfast. Cook up the bacon, shred the cheese, and prep all the pots and pans (and yeah, do as much cleanup as possible) while the buns are rising and you should be really well-set. And if poaching eggs isn’t your thing, over-easy fried eggs will work just as well! Dust a small baking sheet with millet flour; set aside. 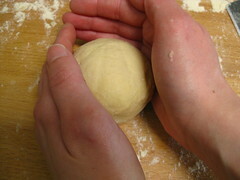 Turn the dough out onto a millet floured surface. 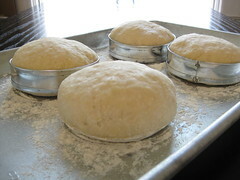 Sprinkle the top with more millet flour, then roll the dough around a little, covering all sides with flour. 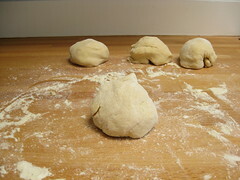 Pat the dough into a disk and divide into six, equal-size pieces. (See photos below for a visual how-to of the next steps. Ignore the rings, I do not use them for this size bun!) Shape each piece into a rough ball; set aside. Pat one ball out into a smooth disk (about 5″ wide). Tuck edges underneath, toward the center to form a somewhat-flat-bottomed, nearly-a-sphere shape. 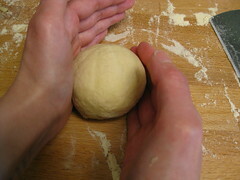 Cup the dough with both hands and gently rotate it — start with hands facing each other, then move your left hand up and right hand down, both a bit clockwise — to form a tight ball. 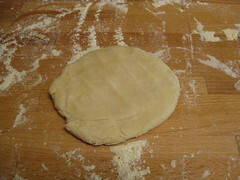 Pat ball out into about a 3″ wide disk (about 3/4″ thick) and transfer to the prepared baking sheet. Repeat with remaining dough. Cover pan loosely with plastic wrap and set aside in a draft-free spot to rise for about an hour or until doubled in height. 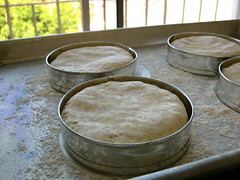 About 15 minutes before buns are through rising, position oven rack in the center and preheat to 425°F. Line a clean, small baking pan with parchment; set aside. 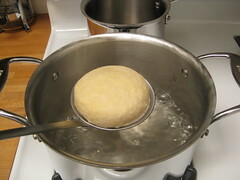 Once dough is through rising, warm the 4 cups water in a 4-quart saucepan or pot¹ over high heat. Add evaporated cane juice to water once it reaches a boil; stir well to dissolve. Place first bun (bottom side down) onto a mesh skimmer² and lower it into the boiling water. Cook for 1 minute on the bottom side, then flip it using the mesh skimmer and cook the top for 1 minute more. Remove the bun with the mesh skimmer, allowing water to drain back into the pot, and place on the parchment-lined baking sheet top side up. (Please note: the buns will look a little puckered after boiling — click here for a photo — but puff right back up in the oven.) Repeat with remaining buns. Please note: As the water level lowers, you may need to gently nudge the bun around using the skimmer to prevent it from sticking to the bottom of the pan. 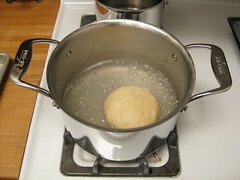 You may also cook two buns at a time if your pan allows, I can do so with the linked 4-quart pot above. 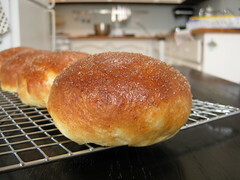 Allow last bun to cool for about 5 minutes before brushing all the tops with one or two coats of egg wash. Place pan in oven and bake until deep golden brown, about 18 minutes. Cool for at least 15 minutes before proceeding. DO AHEAD: Buns are best enjoyed the same day, but may be made a day or two in advance. 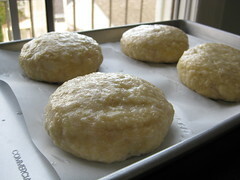 Store buns unsliced and tightly wrapped at room temperature. In a 4″ deep saucepan, warm water and vinegar over medium heat until a few small bubbles start surfacing. Crack egg into the hot water, wait about 30 seconds before touching it. Using a slotted spoon, gently loosen egg from the bottom of the pan. Gently nudge the whites (still a bit clear at this point) around the yolk to form the egg into the nice poached egg shape. Cook for 3 to 4 minutes total — the yolk with be runny, whites set³. Remove egg with a slotted spoon to a paper towel lined plate. Repeat with remaining eggs (no need to change water unless it is too cloudy — that means the water wasn’t quite warm enough when the egg went in). DO AHEAD: Can be made ahead of time in batches, and reheated just before serving. Bring a fresh pot of water to a simmer, gently place all of the poached eggs into the water (they can be touching), and heat for 1 minute (if reheating from room temp, longer if the poached eggs were refrigerated). Drain eggs and proceed to sandwich assembly. Position oven rack about 6″ from boiler, preheat broiler to high. Line a large, rimmed sheet pan with aluminum foil; set aside. Slice buns and arrange cut side up on sheetpan; top each half with about 1/2 ounce (2 tablespoons) of the cheddar. Place pan in preheated oven and broil just until cheese is melted (about 1 minute). Onto the cheesy bottom bun halves, divy up the bacon, avocado slices and poached eggs. Sprinkle with cayenne, top with cheesy bun tops and serve immediately! ¹ If your pot is much wider than 8″, you will likely need to use more water and sugar. ² Mine is an all metal one from Ikea, purchased years ago. It’s no longer available, but this one is highly rated and available through Amazon or this rubber handled one from at Ikea.